When you think of music and sound engineering, West End and Broadway musicals aren’t necessarily what first spring to mind. 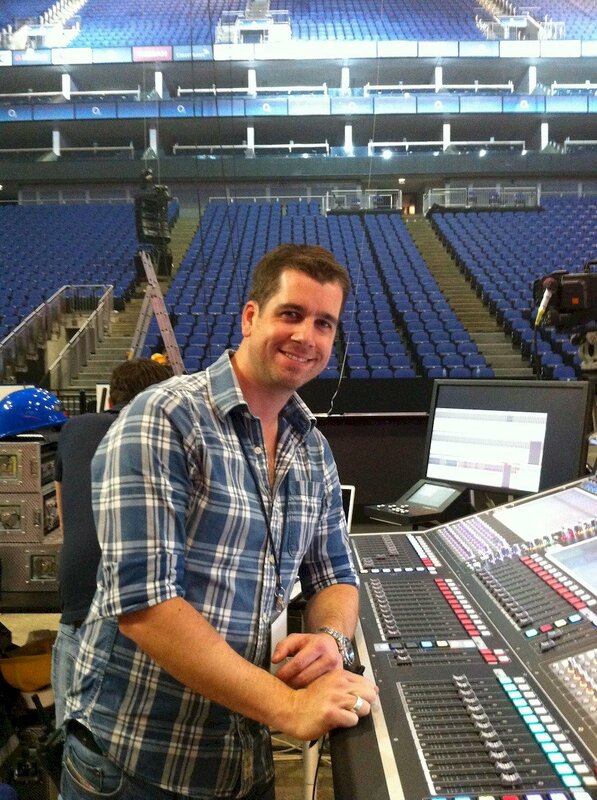 But meeting with British mixer and sound designer Paul Gatehouse, an awesome talent behind some of the biggest stage shows in the world and with technical skills to rival the best in the industry, you begin to see things in a different light. He enthuses about the challenges and complexities of technology in live theatre, the genre’s lack of recognition in the wider music industry, his more recent move into the studio world, and the wizardry of his Sound Radix tool kit. Well it all sort of all came about when I first saw my friend’s new Fender guitar, one random day in the school music room. He brought in this guitar and that set the whole thing off. I picked the instrument up myself and began to learn it, just self-taught, and became interested in music that way. I also had a technical interest in anything gadget like and tinkered around all the time, so it all was driven from that. I was also exposed to music fairly early on, my parents had a decent record player and I used to mess with that. The first LPs I can remember playing were ‘The Phantom Of The Opera’ and The Beatles ‘White Album’. Then we got a band together at school, started playing and practising every day, which forged my interest in music and music technology, though not really with an aim of being a professional musician. We were quite lucky in that we were in a newly funded music programme and had access to a lot of new equipment - a TASCAM Portastudio 4-track cassette recorder, amplifiers and drum kits and mics and PA systems… and we had a brand new drama theatre as well with a sound system and a lighting rig. So I was very very fortunate at school to have that sort of ‘playground’, and that’s where it all started. But to get from being a guy in a band at school, to being behind the sound design of some of the biggest shows in the world - how did that leap happen? It happened over period of probably about 10 to 15 years, starting right back at the theatre in my home town of Plymouth, [UK]. I knocked on their door quite early on to try and get some practical experience in sound engineering. There was a really great guy there called Mike Palmer who was the Head of Sound, and he gave me a ton of opportunities to operate the shows and create sound effects and soundscapes and help him with sound design, then learn about system design and integration. But mainly it was the mixing of the shows that was my main interest. It is a great producing theatre; they did a lot of their own home-grown work. So I was there about 7 or 8 years. All the big London shows used to come through, a lot of the big tours used to start there, so I was meeting all the guys that were coming down from London, guys I massively looked up to. Then I sort of tagged onto their coat-tails a bit really and headed up to London with a job running radio mics on Miss Saigon when it was still at Drury Lane. We were still on VHF frequencies then - it was still the pioneering days of radio mic technology before UHF came into play, so that was all good fun! We had a massive 72-input Cadac e-type at front of house. In the early 80’s, one of the big sound designers of the time, Martin Levan, introduced a lot of studio technology into theatre, so theatre all of a sudden became very sophisticated sound-wise with new loudspeaker technology, consoles and outboard effects that were in use. It went from being maybe a couple of mics on wires and a few mics on the floor in front, to fully close-miked orchestras, 20 or 30 radio mics… So it was great to come into the theatre and see all that happening. So to anyone sitting in a youth theatre in the back end of nowhere spinning in thunderclaps and rainstorms, managing a couple of mics, the thing is to keep at it, because they could end up one day doing what you’re doing? Yeah absolutely. As everyone says, it’s all about relationships and meeting the right people, and being focused on what you want to do and taking chances when they come along. I left home quite young and moved to London. London’s not a fun place to be when you don’t have a lot of money. But the job was fun, so I stuck at it, and from there moved onto shows like The Lion King, and gradually progressed through the ranks. The important turning point was making the decision to go freelance, and then moving to focus on the production side of theatre as opposed to being a full-time sound operator. I met Mick Potter, who is a highly regarded sound designer; I became his assistant programmer, and gradually associate. We started to work on the big Andrew Lloyd Webber shows, the Cameron Mackintosh shows; we’ve done great things like been out to Vegas, and Broadway, and all over Europe. It has been an amazing journey when I look back... I think I was 17 when I started at the theatre, must have been about 1994, so over 20 years ago. It’s good to be able to trace back through and see how it all happened. The music and the sound in West End shows are absolutely stunning. But somehow the genre of musical theatre is sometimes disregarded by the pro audio industry, why do you think that is? I think it’s probably not as well understood or exposed as the other disciplines. Theatre sound design in a way is much more complicated, with the large distributed systems we use, covering a 3 or 4 level theatre. There’s a lot of planning, drawing, calculations and math that has to go into it in order to integrate it all properly and make it coherent, and make sure everyone is getting an even coverage; a distributed, enveloping sound throughout the theatre. Compared to a concert format which could be a left-centre-right and delay towers, covering a conventional space, which in itself presents other challenges. Plus you’ve got live speech, singing, a band, sound effects, and it’s live, every night. In some regards it’s the hardest discipline not the easiest, yet it seems people don’t respect it in that way? Yeah it is. There is a long rehearsal and technical rehearsal period where all those departments you mention are made to come together as one, then once that is set then everyone plays their part and they know what they’re doing. The sound operator is mixing 40 vocal mics live - albeit with the help of scenes on a console which you can break down to VCAs and master faders alongside orchestra and external effects. It is a very skilled discipline, to mix dynamically in real-time and to realise the brief of the producer, director, composer and sound designer. We run over two complete MADI streams of audio on any show. Well over 128 channels, then on top of that effects triggered from QLab and reverb - we normally use the TC System 6000 for reverb - and that’s all operated and managed on the fly. We do get a lot of people who come and sit with us on the sound desk and they’re always blown away by the technology it takes to drive a modern musical. We try to make it a seamless process, but it’s in fact very intricate. I think people in other industry disciplines just don’t know much about it, and that’s why they maybe disregard it a little bit. What have been the defining technology milestones in your musical production career? I think seeing the early Digital Audio Workstations like the Atari Notator when I was young– [C Lab Notator but run on the Atari ST – later became Logic]. I had access to that and it was definitely one of the light-bulb moments of using that sort of technology and thinking, wow it would be cool to do this for a job and work in a studio. Then other instruments like Boss drum machines and sequencers. I’ve never really been into synths, I’m more of a guitar person. Then when I got into the theatre world we were using large format sound consoles, not studio brands, but more like Soundcraft and Midas. I always see those as big toys I can have a lot of fun with. The technology now in comparison is so advanced - with the consoles we use from DiGiCo. Andrew Bruce at Autograph and a lot other guys have developed a special ‘T’ package as theatre software extension, which gives you a lot of programming options unique to theatre, controlling how you want to manage scenes, defining which parameters auto-update across different scenes, lots of very clever things which we use today. So now you’re more studio-based, and have discovered Sound Radix; how did you first find out about them? About 4 years ago I made a choice to go full-time on the freelance mix engineering, basing myself in my own room and forging ahead in that direction. I still had this bug that I wanted to be a studio engineer, but with a sense that the studio industry was evolving a bit and with the accessibility of Pro Tools allowing people to do it themselves, it felt like now or never. I discovered Sound Radix through the internet when I was trying to automate the process of aligning a sample with a kick drum to tighten the low end punch. I typed in something like “auto-align sample”, and the perfect Auto-Align solution came up from Sound Radix. I tried it out, and it worked within 5 seconds, doing exactly what I wanted to do, which is the perfect definition of technology really! Then I had a look at their other products and they all seemed to be really forward thinking creative tools that take advantage of the digital age. Which are your go-to Sound Radix plug-ins when you’re in the studio? Auto-Align is a staple. Actually I use everything apart from 32 Lives, purely because I don’t need that one. In terms of workflow, the plug-ins are all part of my session prep. When the files come in and I’ve got things laid out the way I want, the phase relationship is one of the first things I look at across all the tracks, because that determines how everything is going to interact with each other. There are so many applications for Auto-Align that I’ve used… I’ve just done some mixes on a new record for Sarah Walk which is going to be out soon. There were some string recordings on that which sound great, but purely because they’ve been recorded in a small room there’s some reflections and comb filtering between the multi-mic set-up. With the four mics combined you start to get some dips in the frequency spectrum, but by using one pair of mics as the reference and aligning the other pair to that you just eliminate that comb filtering and the sound becomes full and solid, and you can still retain the sense of depth because you get the different choices of alignment points. Do you find Auto-Align works well in live performance too? There must be mics pointing in every direction possible? To some extent - mainly in recordings of live work. In the orchestra pit an instrument could be covered with a couple of mics - a close and an ambient; or say there’s one woodwind player on sax and clarinet and flute, you need to cover those different positions, and being able to manage the virtual position of those microphones using delay is very helpful to get an overall cohesive blend without comb filtering and colouration. A good example recently for a live situation, was when using two mics on a contra bass, one under the bridge and one covering the body. I was able to record them, import the files into Pro Tools and work out the delay from the body to the bridge to the nearest sample with Auto-Align. Then transfer the delay off-set to the console and bang, a solid contra bass sound with body and definition. The same with drums and other multi mic set-ups, it can give you a helping hand to find good cohesive mic positions and also to correct problems that you can’t remedy physically. Do you use Drum Leveler? Are you finding, like a lot of people, that you use it on everything, not just drums? Yes, Drum Leveler is another awesome tool. I often use it on bass as well. Because you’ve got the two thresholds you can mange a dynamic signal with so much efficiency; and you’ve got the variable rate of compression from 0% to 100%, it’s not just on or off, you can find so many positions where it works, by bringing up the low-level signal and then setting the high threshold to control the peaks. Case in point, on Sarah Walk’s record I was able to really precisely pick out a ride cymbal from a set of overheads; in the overhead mics there was too much snare to ride, and the ride was really important. I could lift up the low level and when the snare hit I could use the top threshold to push that back down again so the snare didn’t become too loud. But much more precisely than say a conventional expander. It’s just a brilliantly designed and thought-about tool. I’m looking forward to what they’re going to do next! It’s great to have these tools in the digital domain, with phase it’s not just 0 or 180, we can do more than that which is great, just gives you more options if you want them. If you could go back to 16-year-old Paul, and give him one piece of advice, what would you tell him has got you this far, the thing that helps you keep making a living out of it? It’s got to be the relationships. It’s all about the people. I’ve been really lucky to work with some ultra-talented people, people who have given me opportunity. My message to my 16- year-old self would be to stay open to opportunities; if things feel like they’re taking a long time, they are, but it’s worth it. I’m almost at that place again now, having taken the route into the studio world, where I’m telling myself the same message, stay open to opportunities and keep on going. I’m trying to meet new people all the time. But I’m finding the music industry a lot tougher than the theatre industry, a lot tougher. There’s a lot of speculative work involved, especially when you’re starting out. It’s a bit more of a Wild West. But then theatre has its pressures in a different way. The productions that we’re working on are multi-million pound investments, so to be trusted with that sort of responsibility is amazing. It’s one of those disciplines where it truly is a case of live or die by your reputation. Creative people want to work with people who they feel they can trust and who they have a relationship with, so you’ve got to keep building on that.